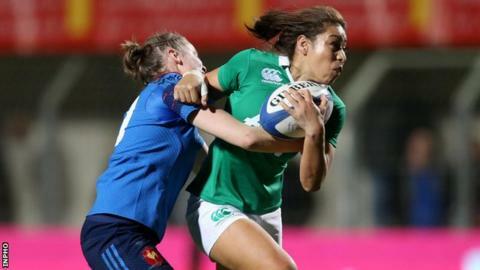 Women's Six Nations holders Ireland suffered a setback in their bid to retain the title as they went down 18-6 to France in Perpignan on Saturday. The French scored two first-half tries, the second a fine individual effort by winger Caroline Boujard, to take a 15-6 lead into the interval. Irish captain Niamh Briggs kicked two penalties to keep her side in touch. A single French penalty was the only score of the second half and the hosts are now unbeaten after two matches. France began their campaign with a 39-0 trouncing of Italy last weekend, while Ireland had beaten Wales 21-3 in Dublin. Audrey Abadie kicked an early penalty for the home side but Briggs levelled when her kick at goal went over off the upright in the 14th minute. Gaëlle Mignot crossed the line for the first try of the game after 19 minutes, before Boujard ran from inside her own half to extend her side's advantage four minutes later, Abadie converting. Another Briggs penalty just after the half hour mark reduced the deficit to nine points, then Boujard landed the only score of the second half. Ireland's next match is a trip to Twickenham to face England in two weeks' time, while France are away to Wales. France Women: Julie Billes (Montpellier); Caroline Boujard (Montpellier), Lucile Godiveau (Bobigny), Elodie Poublan (Montpellier), Laura Delas (Tarbes); Audrey Abadie (Blagnac-Saint Orens), Yanna Rivoalen (Lille-Métropole RC Villeneuvois); Lise Arricastre (Lons), Gaëlle Mignot (Montpellier) (capt), Julie Duval (Ovalie Caennaise), Celine Ferer (Bayonne), Audrey Forlani (Blagnac-Saint Orens), Laëtitia Grand (Lons), Pauline Rayssac (Montpellier), Safi N'Diaye (Montpellier). Replacements: Agathe Sochat (Stade Bordelais ASPTT), Arkya Ait Lahbib (Stade Rennais Rugby), Romane Menager (Lille-Métropole RC Villeneuvois), Julie Annery (Bobigny), Laure Sansus (Stade Toulousain), Camille Imart (Stade Toulousain), Coralie Bertrand (Stade Toulousain), Patricia Carricaburu (Lons). Ireland Women: Niamh Briggs (Munster, capt); Elise O'Byrne-White (Leinster), Aine Donnelly (Leinster), Sene Naoupu (Connacht), Mairead Coyne (Connacht); Nikki Caughey (Ulster), Larissa Muldoon (Skewen); Ailis Egan (Leinster), Cliodhna Moloney (Leinster, Ruth O'Reilly (Connacht); Sophie Spence (Leinster), Marie-Louise Reilly (Leinster); Paula Fitzpatrick (Toulouse), Claire Molloy (Bristol), Heather O'Brien (Toulouse). Replacements: Zoe Grattage (Munster), Lindsay Peat (Leinster), Fiona Reidy (Munster), Ciara Cooney (Leinster), Ciara Griffin (Munster), Mary Healy (Connacht), Nora Stapleton (Leinster), Jackie Shiels (Richmond).